I have been a customer with them for around 3 years now and really enjoyed their services where most of my work gets done over the phone and by using their net banking facility. It is the first private bank as per my experience, which started providing 2-Step Verification Login system, even before Citibank and since then it keeps surprising me with so much wonderful services. Last year, I used to travel to South-ex for my Linux & Windows Server courses and at times I sent one of my friend to their South-Ex branch to deposit money in my account. My friend told me that its too hectic to deposit the money in Kotak bank and I was shocked to hear that. When I asked him that what exactly happened and what issues did he face while depositing the money, then he told me about the poorly managed long queues and slow working of the cash department. I could not believe his words about Kotak Bank, as I had used their services quite a lot over phone before he told me about his experience. One day, when I got time then I personally visited the branch to deposit money in my account. I did not find anyone in the cash deposit counter, once I asked about the staff then someone pointed me to a guy named Mr. Vinay Kumar who was busy talking to a lady colleague. I was in the waiting mode til sometime but when it was getting too late then I told him that I need to deposit money and have been waiting for quite a long time. 1) Whose account is this? 2) Why I need to deposit the money in my account? 3) What is the purpose etc along with too many irrevalent questions as if I am a terrorist depositing money in my own account. At the end, he told me that its a salary account and depositing money in the account is not allowed, denying my deposit slip. I was like :o, I never heard of this rule from RBI that one can not deposit money in a salary account. Specially, when I myself deposited money at times in a Kotak Branch, near my home. I asked him then why he was asking so many questions and could have told me the rule specified by him at the first go instead of wasting my time. I also asked the lady about the specified rule with whom Mr. Vinay Kumar was busy in conversation before I asked him to come to counter and she told me the same thing. I tried looking for the Branch Manager in his cabin so that I can confirm with him before I proceed further but I could not find him so I left the branch with no service. I deposited the money in my Citibank account and glad that it was next to the Kotak Branch in the same lane. Later on, I transferred the money to my Kotak account via internet banking as a payment was due from my account. Can you believe that he denied the cash deposit by me, for my own account when a payment was due for Kotak Bank itself. It was a small payment and had it been a huge payment then he could have asked for my Pan Card but he simply told me a new rule which I was not aware of. Even I could not believe that he denied such an important work just because I interrupted him from his personal talks and asked him to come for duty. I called up the customer care and asked them if there is such rule in Kotak Bank. They told me that there is no such rule and was surprised to know that, I asked them about their higher authorities contact details so that I could complain about the working of South Ex branch but they did not have any. Many times, I called up the customer care guys for different services and asked if there is any rule or not as told by a Kotak Employee but every-time they denied about it. I have deposited money multiple times in a branch near my account with no such rule and hence it was confirmed that it was a personal rule by Mr. Vinay Kumar from South Ex branch. Such employees can't do any thing good for the company rather they destroy a customer's relationship with the bank ruining the reputation of their employer. Since then, I never recommended my doctor friends working in AIIMS to open an account in that particular branch. Few months back, I opened a Jifi account as well with Kotak Bank and faced a severe cheque lost issue with the near by branch. I kept tracking my complain number for the lost cheque even if the branch closed it stating that the customer was pacified and I was again like :o? Anyhow, I kept on asking for my lost cheque which could be misused by anyone and then they gave it back to me stating that it was there in some pending lot. I keep using Kotak's internet banking which is secure and trusted along with other services provided by them. I know their services are simply awesome and innovative like the Jifi account. Recently, I also saw a notification on their website for sending money via Email. Might be the way we do using Paypal though I have not used the service yet. They have also launched a new method of sending money to your Facebook friends irrespective of who you bank with as shown below. Both these innovative services from an Indian bank are yet to be tried by me and I will update my experience here only. 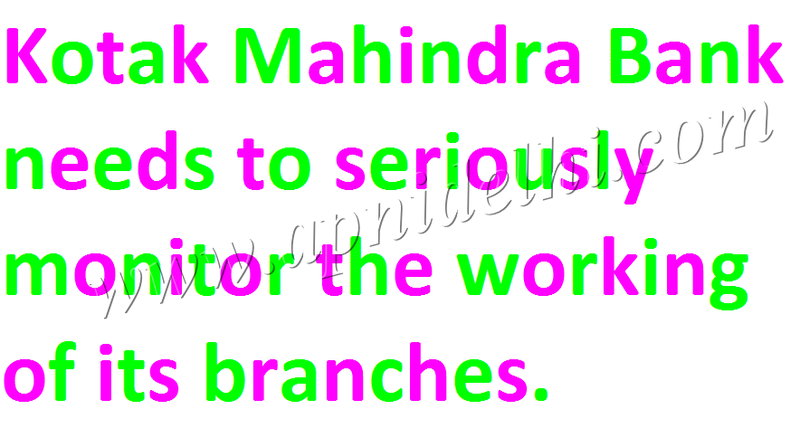 Trust me Kotak Mahindra Bank is really a nice bank and until now its been a pleasure using their services if I do not count the service provided by their branches. But, in this world of competition where more and more banks are emerging in the field they seriously need to monitor the working of their branches else they will destroy not only the customer relationship of the bank but also the loyal customers as well. Be it by closely monitoring the working of their executives or by making a more visible complain system so that customers can complain directly to higher authorities when they are in need, specially when people like Mr.Vinay Kumar creates their own rule. Such employees need to read and understand a very well statement by Mr. Mahatma Gandhi which I got to read when I was at a Passport Seva Kendra. “A customer is the most important visitor, on our premises. I hope to continue my relationship with Kotak until I don't face such issues in their branches. Seriously, I want to use Kotak Bank's services so I try to avoid visiting their branches as much as I can. Do you have any account with them or any pleasant or unpleasant experience? Do share with us be it Kotak or any other bank so that we can also use the services of your nice bank.